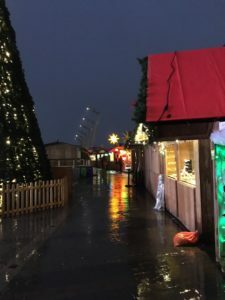 What is new in the Christmas Market for 2017? 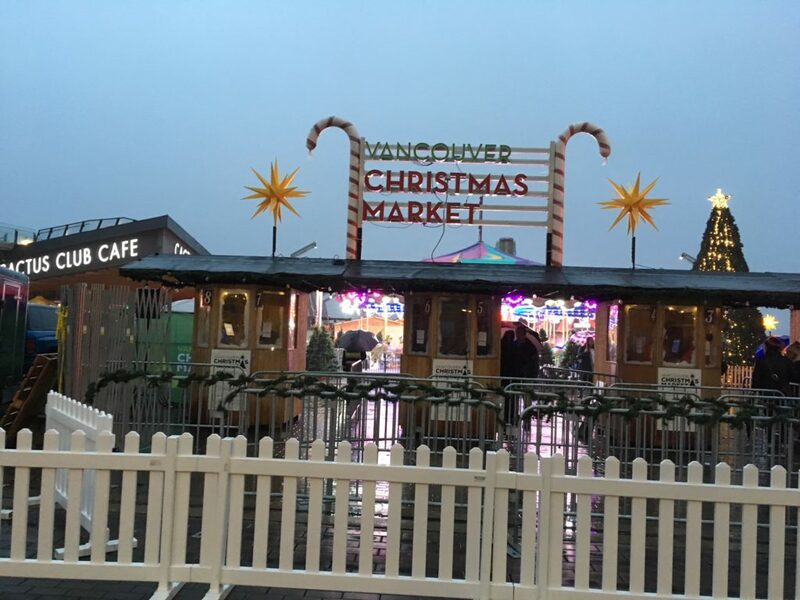 You are here: Home | Cultural Events | What is new in the Christmas Market for 2017? 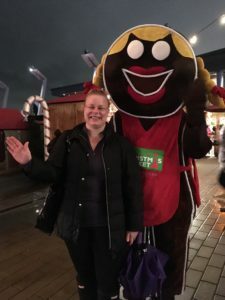 Celebrating 8 Years of Vancouver Christmas Market! Some things have changed, but some things have stayed the same. 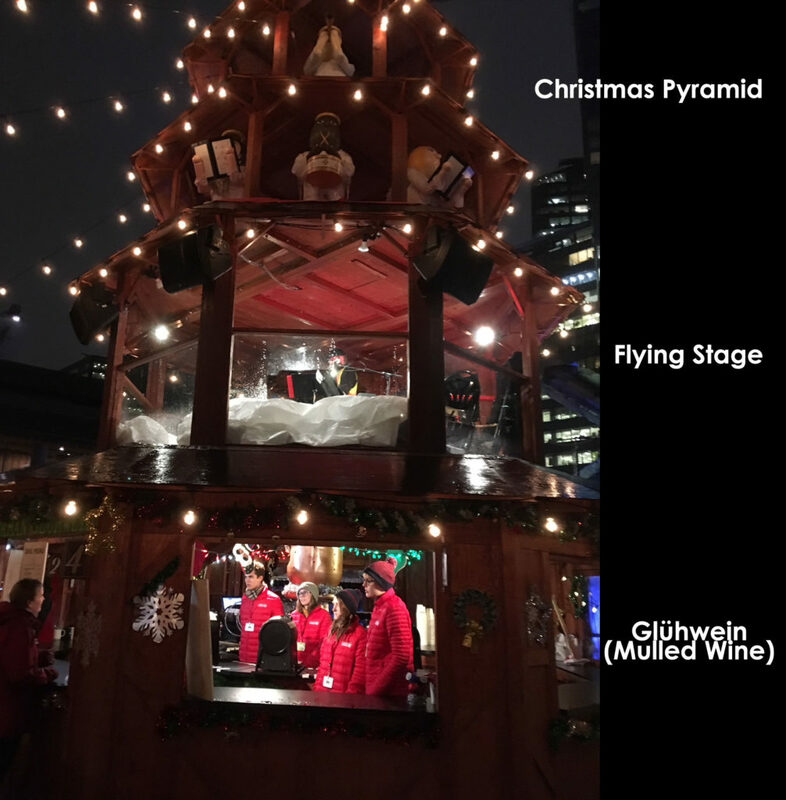 There are still lights, booths, the carousel, but also new vendors, new activities for children – kids who complete the scavenger hunt earn a free ride on the carousel – and new, at least to me, “Flying Stage” on the second storey of the Christmas Pyramid, right above the Glühwein! 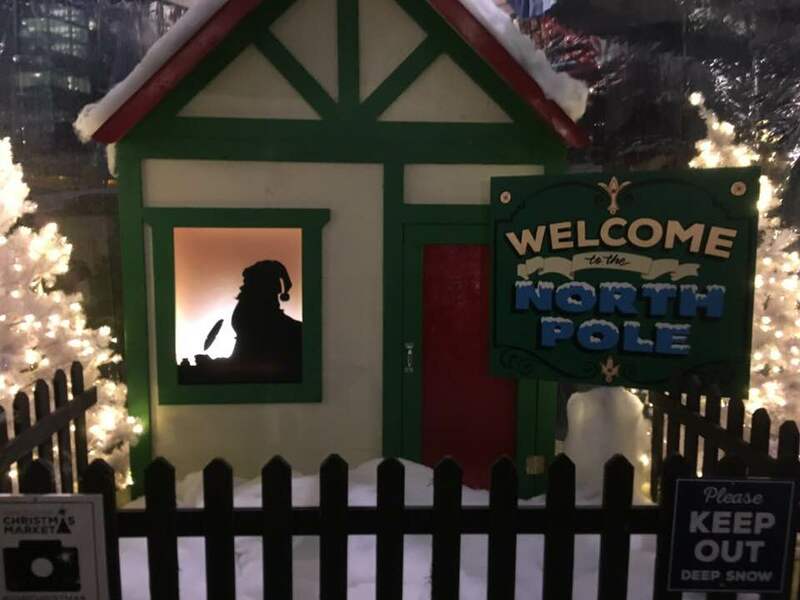 You can also take some pictures right inside the Alpine Haus at the “North Pole” that has been set up there. 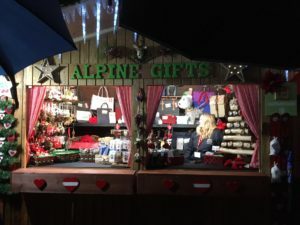 For my German, Swiss and Austrian readers who have been spoiled with a wealth of Christmas Markets back home, the biggest complaint is having to pay an entrance fee, but there are still deals, groupons and other specials to be had. If you order online, you also receive a complimentary seasons pass, so that is worth it. 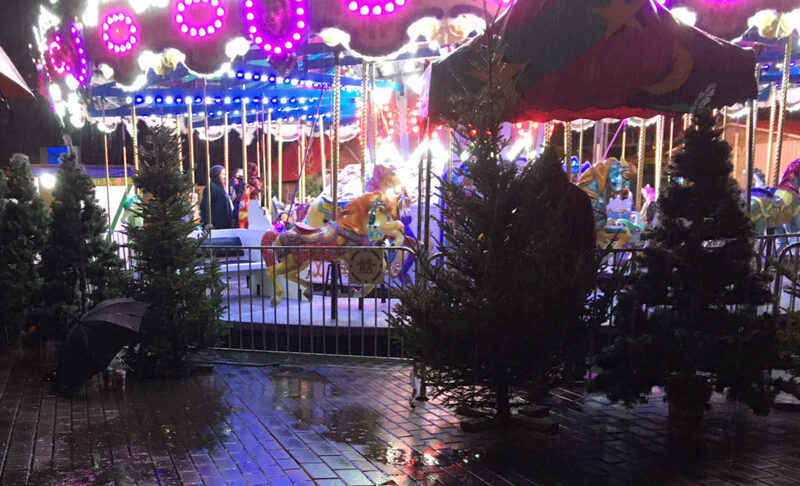 This year, entrance fees are $10 for Adults, $9 for Seniors, $5 for children ages 7 to 12 and 6 and under are Free. There are also discounts available for groups of 12 or more or if you show up before 4 pm on Weekdays. 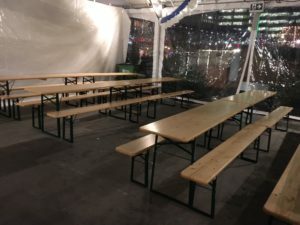 A change that was made is that the Market, with over 75 vendors, has now been split into three main areas: Handwerkgasse (Artisan Alley), which includes Zotter Chocolates, Candymeister and Sonnentor Tea. 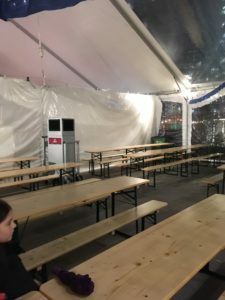 Marktplatz (Eats and Treats), which includes Freybe Brat Haus, Das Bavarian & Pretzel Haus, Das Lachs Haus (Salmon), Das Schnitzel Haus, Das Kartoffel Haus and Das Waffle Haus. Suddenly I am starving! 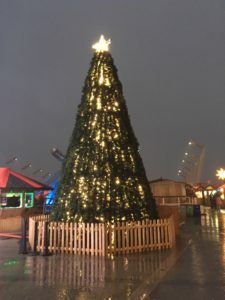 There are also Kaufmannsgasse (Merchant Alley) and the “Tannenbaum Terrace” (Christmas Tree Terrace). I really saw an effort to be more German and to have more German signage. I appreciate that and felt it was much more authentic. 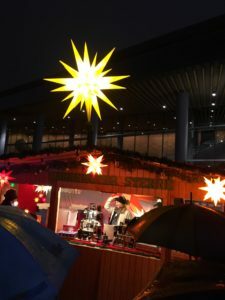 There were also many Herrnhuter Stars placed at every booth and other strategic places around the venue. Beautiful. 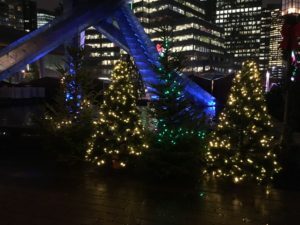 This is North America’s first 30-foot walk-in Christmas Tree with around 36,000 lights – room for the whole family inside! This is what is officially known as “Kaufmannsgasse” or “Merchant Alley”. 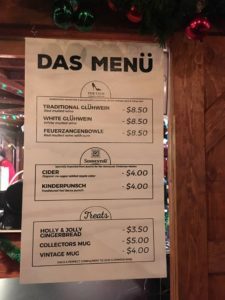 Includes Herrnhuter Sterne (Stars), German Steins and Das Stollen Haus. 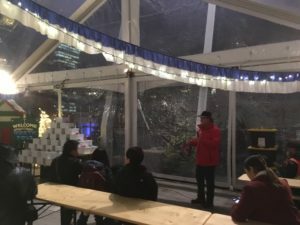 Malte Kluetz, President of the Vancouver Christmas Market, in the Alpine Haus, letting us know what we can expect in the warmth of the best beer tent in Vancouver! 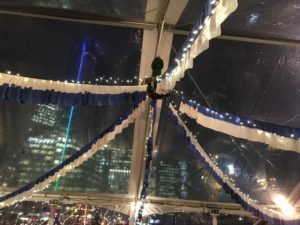 A large heated tent with stunning water views and plenty of seating, the Alpine Haus provides a cozy place to socialize, eat, drink, and recharge for more holiday fun! 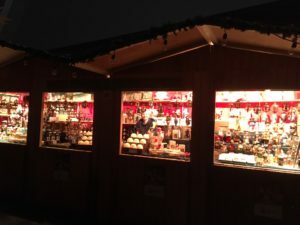 This has got to be my favourite part of the Christmas Market – too cool! 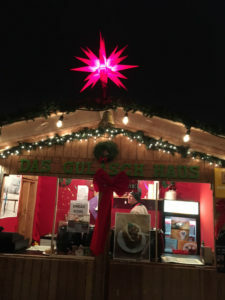 Alpine Haus – stay warm and dry while you eat & drink and are merry! 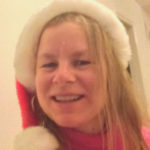 Is this Holly or Jolly? If it is Jolly, that makes two of us! 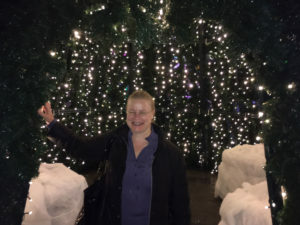 Thanks to the volunteer who took the picture! Never thought I’d enjoy drinking out of a shoe so much! 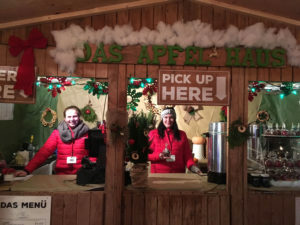 Das Menü for the Gluehwein – basically with or without alcohol and with or without gingerbread. Then do you want the collectors or vintage mug? Melanie Dekker: A voice like chocolate. 100 concerts a year. A soulful roots-pop entertainer. A songbird and prolific writer who has created fantastic hit songs and 6 albums. Her percussive guitar style and warm lyrics quickly fire up your heart. She’s opened for Faith Hill, Chaka Khan, Bryan Adams & headlined folk festivals in Canada, Germany, Denmark & Estonia. 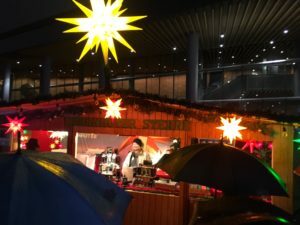 A Christmas Concert by the German Consulate was held November 23 for the German Community!